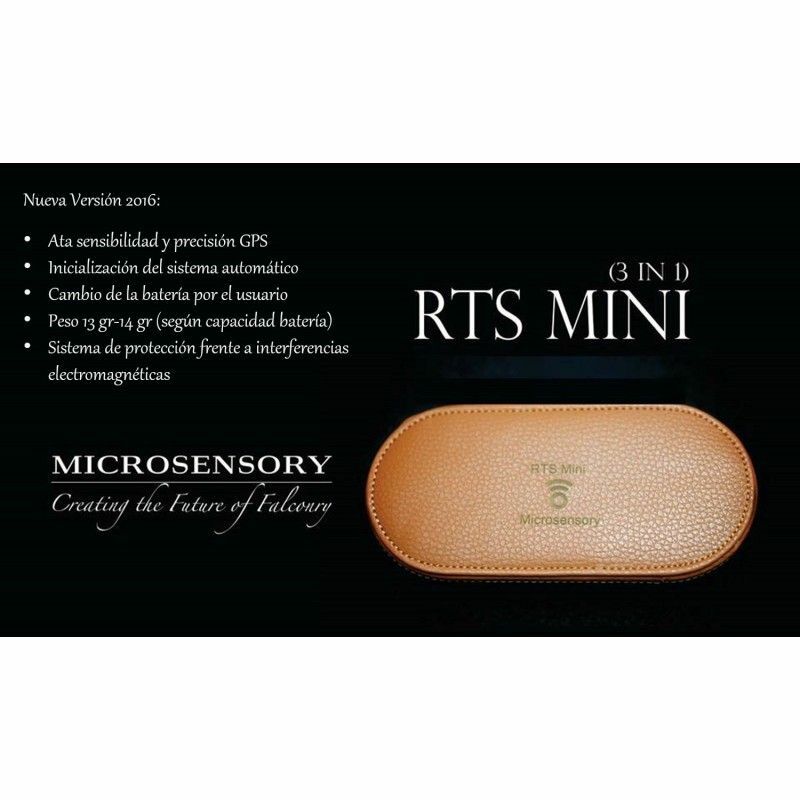 RTS Mini, is a revolutionary system of high-tecnólogia that is changing the horizon of telemetria, offering in a single transmitter 3 in 1 features following . 1 - Transmitter Radio tracidicional working in all UHF frequencies and is compatible with all receiver UHF. By buying this product you can collect up to 45 points . Your cart will total 45 points that can be converted into a voucher of 9,00 € . 3. Phone within the issuer, to find your bird in case of loss of the radio signal, sending the GPS location via SMS to the user with a link to Google Maps to view the article in the browser of your mobile phone. Our transmitters allow you to locate your bird anywhere in the world from your mobile, even within closed places, without GPS coverage. Con any receiver on the market of UHF, we will be able to locate it via radio without cost in areas without GSM coverage. With the RTS mini 3-in-1 Full can in addition analyse their kinetic behavior, see temperatures and at great heights, and an endless number of utilities. Indicates the distance, direction and height of the Bird, allows you to see in a second, the 3D position of your bird, to know if you are flying in thermal or intends to move away, allowing you to take immediate action to avoid losing your bird, or if that move helps you anticipate location. GPS integrated in the transmitter and receiver of ultra-low consumption of last generation. GPS+GSM (phone) nenables you to locate the bird at any point in the world with GSM coverage. UHF TRANSMITTER of 433 MHZ to 434 MHZ. To 1,000 channels. New technology invented by Microsensory, free of background noise in addition to allow you to locate dozens of birds simultaneously without changing the frequency. Rechargeable battery easily interchangeable. You can purchase more batteries at our online store. With autonomy of 3 to 5 Days, depending on use, state of the GSM network and number of locations. We saved in its memory the data of height position sensors and transmitter to be downloaded to your PC via the application MyFligh RTS (included in the pack). Directional antenna, mini antenna rubber, charger socket, charger to connect the car,compass, strap, carry case for transport. Software MyFlightRTS ( designed by Microsensory), a Powerful software that will allow you to analyze the flight of a bird even lets you analyze the time and in that time, and with how much intensity he killed his prey. Resolution of 25 Cm with a range greater than 15 Km in direct view. Calculate the speed of the ascent and descent of the bird, in meters/s and Km/h. Resolution 0.1 Degrees celsius from -40 degrees to 90 degrees, allows us to see his behavior to extreme temperature. High-sensitivity and accuracy GPS with the addition of a GPS antenna outside. Initialization of the automatic system without any intervention of the user. Simple and ready to use. Change the battery by part of the user, which allows multiple possibilities of use and an increase of the autonomy in our outputs. A very light weight with the best performance and autonomy. System of protection against electromagnetic interference.